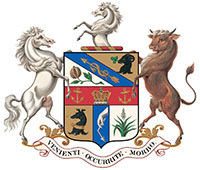 Sponsorship of 2015/2016 Season Ladies Hockey Teams of the Royal Veterinary College. 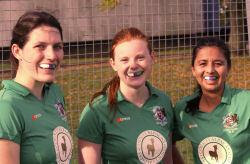 Nyewood Dental Practice are delighted to have co-sponsored the Royal Veterinary College Ladies Hockey teams with bespoke Mouth Guards in the College’s colours. 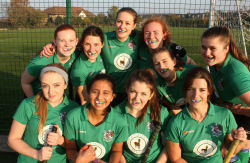 In conjunction with our co-sponsor, Felpham Dental Ceramics, we have provided the players with custom made, close-fitting mouth guards. 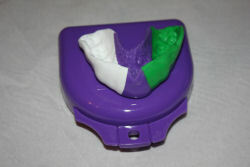 Wearing a mouth guard will help to protect their teeth from the impact of a hockey ball, a hockey stick and/or horses hooves. A donation was also made to the Gurkha Welfare Trust charity as the 1st IX captain has been involved with and voluntarily assisted on one of their Dental Camps in Chitwan, Nepal. Sponsorship of The Pagham Pram Race. In 2014 Nyewood Dental Practice were delighted to be asked to become a corporate sponsor of the world famous Pagham Pram Race and have continued to support this great local event ever since. The Pagham Pram Race in 2015 celebrated the running of it's 70th race. The race started in 1946 when a group of demobbed servicemen decided they would hold a pram race. One person pushing the pram and another as a baby in it, making sure to drink a pint each, at all the villiage pubs. The prize then, was a christmas fruit cake. Since then the Pagham Pram Race has been run every year on Boxing Day, whatever the weather, a course of approximately 3 miles . Lately there has been as many as 60 entrants, some of these are fantastic designed floats usually accompanied by topical fancy dress costumes. Entrants have come from as far a field as Australia and USA. 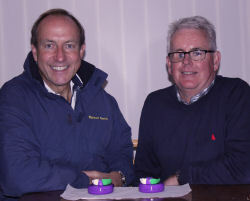 During these years many thousands of pounds have been raised for local good causes both from the entry money, and of course, donations from the thousands of members of the public that line the route.